In this part we will implement a responsive layout by using the grid. This layout will have a header, footer and a content area with 3 columns. Insert a layout grid. Set the column count to 1. Optionally set the background style. 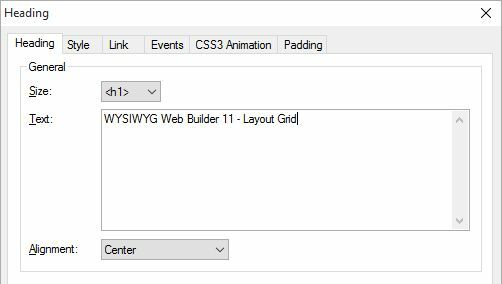 Add a Heading object and drag it inside the grid. To create some extra spacing around the heading, the margin has been set to 10. The Layout Grid of the footer will have 5 columns. One for the copyrights (and other info) and the other 4 to align social media icons. Insert another layout grid. Note that the grid will automatically be postioned below the first grid. You can change the order of the grid with the Arrange Tools (Move Forward/Move Back). Set the column count to 3. If you test this layout in the browser you will notice that everything will scale nicely when you change the viewport size. When the window becomes smaller than 480 (= breakpoints) then all columns will automatically stacked. Note that each grid can have its own breakpoint! This grid will have a menu, text and image. Note that although we have only added one object in this demo, you can put multiple object inside a column! The following templates use the Layout Grid. These templates can be downloaded from the template section of this website. How to use Master Frames with Layout Grids? Re-arrange layout grids and the objects inside the grid. As you have noticed the positions of layout grids and objects are determined by the order you add them to the page. However you can later re-arrange them by using the Arrange tools. For example if you wish to move a layout grid up then you can use 'Move back' to change the order. The same can be done with the elements inside the grid.